A well proportioned semi detached bungalow for sale on the Fairfield Estate in South Wigston. The accommodation comprises entrance hall, lounge, kitchen, rear lobby, two bedrooms, bathroom, gardens to the front and rear, off road parking and garage. The property is being sold with ‘No Upward Chain’. For more information or to view call Phillips George on 01162168178. SUMMARY A well proportioned semi detached bungalow for sale on the Fairfield Estate in South Wigston. The accommodation comprises entrance hall, lounge, kitchen, rear lobby, two bedrooms, bathroom, gardens to the front and rear, off road parking and garage. The property is being sold with ‘No Upward Chain’. For more information or to view call Phillips George on 01162168178. ENTRANCE HALL With radiator and access to the loft which is boarded. LOUNGE 13′ plus bay x 10′ 11" max (3.96m x 3.33m) Having bay window to the front elevation, gas fire with back boiler behind and radiator. KITCHEN/BREAKFAST ROOM 9′ 6" x 8′ 2" (2.9m x 2.49m) Comprising base and wall mounted units with complementary work surfaces, built in cupboard, sink unit with drainer, electric cooker point, tiled splash backs, window to the side elevation and radiator. LOBBY With storage cupboard and access to the rear garden. 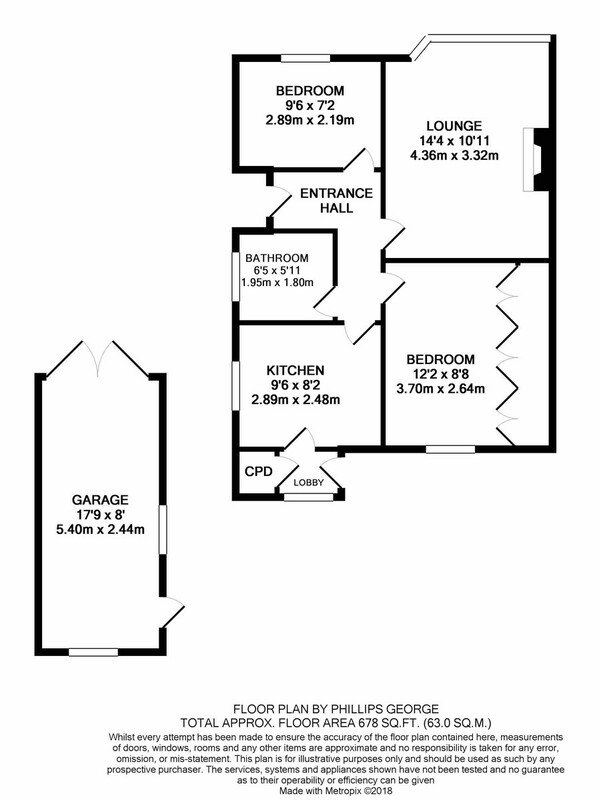 BEDROOM 12′ 2" x 10′ 11" max (3.71m x 3.33m) Having built in wardrobes, airing cupboard, radiator and window to the rear elevation. BEDROOM 9′ 5" x 7′ 2" (2.87m x 2.18m) With window to the front elevation and radiator. BATHROOM 6′ 5" max x 5′ 11" (1.96m x 1.8m) Comprising enamel bath, pedestal wash hand basin, low flush w.c., tiled splash backs, heated towel rail and window to the side elevation. OUTSIDE The front of the property is set up with a rockery style garden, being pebbled and paved with plants. There is a driveway running down the full side of the property and leading to the detached garage. The rear garden is also paved and pebbled with a fenced surround and gated side access. GARAGE 17′ 9" x 8′ (5.41m x 2.44m) Being of asbestos construction and with double doors to the front, windows to the side and rear elevations and courtesy door to the rear garden. VALUATION Our award winning staff would be delighted to provide you with a free market appraisal / valuation of your own home. Please contact Phillips George to arrange a convenient appointment on 01162168178. DISCLAIMER & IMPORTANT INFORMATION Phillips George Sales & Lettings for themselves and the vendors of this property whose agents they are, give notice that these particulars are not to be relied upon as a statement or representation of fact and do not constitute any part of an offer or a contract. Intending purchasers must satisfy themselves by inspection or otherwise as to the correctness of each and any statements contained in these particulars. The vendors do not make or give and neither do Phillips George Sales & Lettings (nor any person in their employment) have authority to make any representation or warranty whatsoever in relation to the property. None of the services, systems or appliances listed or shown in this specification have been tested by us and no guarantee as to their operating ability or efficiency is given. All floorplans and dimensions have been provided as a guide for prospective buyers only, and should not be relied on as a true representation. Current money laundering regulations require us to confirm proof of identity and residency of anyone intending to purchase. We ask for your co-operation in providing the necessary documentation in order to avoid delays in agreeing the sale.